Berlin in June became the first German city to impose a cap on rents, limiting price increases on new leases to 10 percent above the local average in areas with housing shortages. Last month, rents fell around 3 percent. A law to limit rent prices in Berlin that came into force on June 1 is already affecting the market, according to figures released last week and posted on the city's leading real estate website. The figures posted at Immobilienscout24 showed rent prices declining by 3.1 percent in the past month. "In June we saw a strong rental price drop of 3 percent in Berlin," Jan Hebecker, head of data and markets at Immobilienscout24, told DW. "That is very unusual comparing to the development over the last year and a half, which had seen rental prices in Berlin rise by around 0.3 percent per month. It seems to be the first effect of the new cap on rents." "In other large cities, where there is pressure on the rental market but still no supervision, rents continue to rise," Hebecker added. 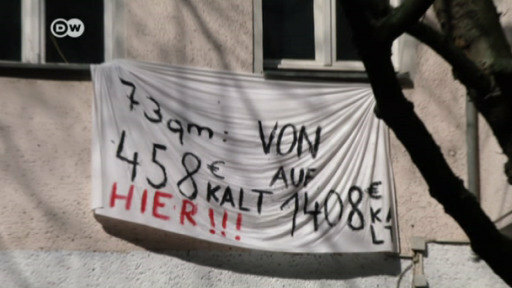 In Frankfurt, for example, rents rose by 0.1 percent last month. In Berlin, 47 percent of the population lives in rented property. Whereas rents averaged just over 5.50 euros ($6) per square meter in 2005, that price had shot up to nearly 9 euros last year. In an attempt to limit the costs of living, the German capital became the first city in Germany to introduce a cap on rents that can be charged to new tenants. Under the new law, the so-called "Mietpreisbremse" (literally, "rent brake"), landlords cannot charge new tenants more than 10 percent over a median rent price per square meter set by a regulatory body for each district in the city. This price, which formerly acted solely as a non-mandatory guideline, is determined according to data collected from a poll held every two years. Owners are still able to raise the rent, but they have to do it more gradually. The new law was introduced as part of existing legislation that allows local authorities in the federal states of Germany to monitor areas where rent prices are too high. Hamburg and North Rhine-Westphalia have implemented the same law as Berlin, and other German states are also expected to do so in the future. Berlin has already taken several measures in an attempt to limit its rising international real estate market, making use of a law that allows it to monitor areas in which rent prices are rising too fast, as well as prohibit the conversion of residential areas into luxury districts.